Born out of the prototypes developed at GlobalHack V, YourSTL Courts became a free public resource in May of 2015 to serve the court users of the St. Louis area. The mobile-friendly web and text message-based tool funnels court records into one online portal where citizens can easily access their traffic ticket, rights in court, court locations and contact information, operating hours, procedures, and fine schedules. YourSTLCourts helps mitigate some of the challenges citizens face when trying to navigate the local judicial system by empowering them with the information they need to keep municipal offenses, such as minor traffic violations, from escalating unnecessarily. St. Louis County has around 90 municipalities, many of which have a small geographic footprint and fewer than 1,000 residents in population. As a result, it is often confusing for those who are given traffic tickets to know what court to go to, what to expect at court, and what can be done to resolve tickets in a way that keeps residents out of jail. With many courts being part time and having limited staff to respond to requests, it is often difficult to get information needed to go to court. If someone misplaces their ticket, finding which municipality or court to go to can be very challenging, if not impossible. Getting information about your personal case or learning if you have a warrant can also be very difficult. Prior to YourSTLCourts no method existed to view court information for multiple courts, from different municipalities using different court software platforms, under a single online portal. YourSTLCourts aims to provide three primary pieces of information: general information on courts, court preparation, and resolving tickets in St. Louis City and County; provide personal court information for cases pending against someone given a traffic citation (including if any warrants had been issued for their arrest; and provide informative updates via text message about an upcoming court case. Court users can look up information with a combination of their name, birthday, drivers license number, and a map to give recommended municipal courts based on where they think the traffic ticket was issued. 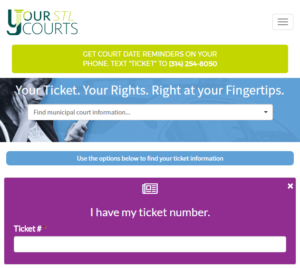 YourSTLCourts ties into multiple court software products by various vendors operating in the St. Louis area and brings that data to the court user. The website has a mobile friendly version in addition to the desktop-accessible user experience. The program is built in a way that various court system data sources are pulled into a single system (either in real-time or on an update cycle when real-time data is not available) which is then accessed by the front-end website and the text message system. 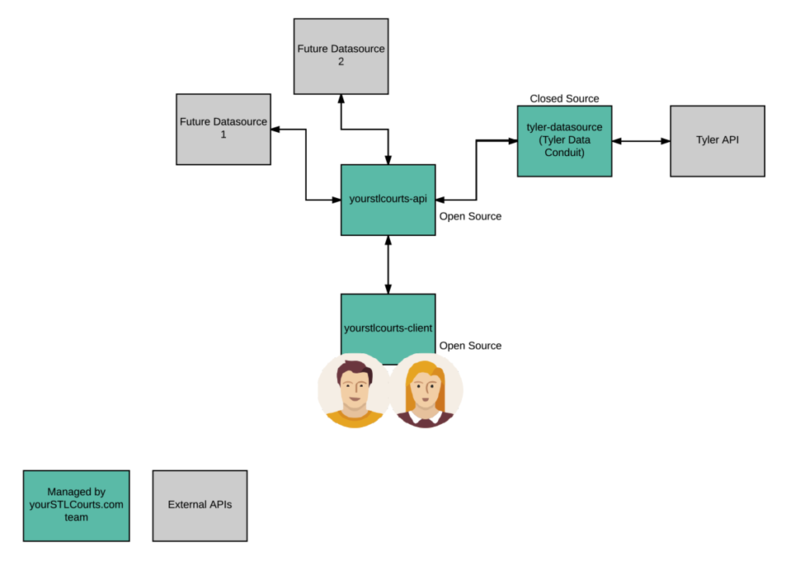 The chart below is a representation of how these data sources come together.